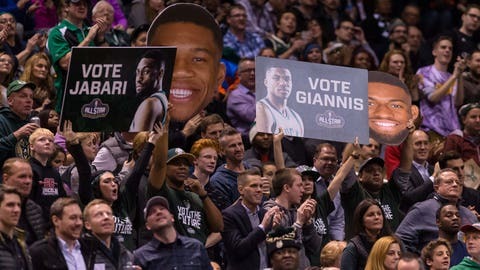 In the 100th episode of our Milwaukee Bucks’ Win In 6 Podcast, we discuss the nature of Bucks fandom, ‘what if’ scenarios and much more. It’s that time of week again where our team gets together to discuss the latest Milwaukee Bucks‘ news and most important conversation points in our “Win In 6 Podcast”! Except this week, we’re not marking just any old arbitrary episode, but our landmark 100th episode! Having hit such a major milestone, let me quickly note just how grateful we are for the continued support and feedback we get, and how special it is to us that many of you enjoy listening to our ramblings from week-to-week. Not wanting to do any kind of regular weekly retrospective to mark this special occasion, we dug out a couple of more general Bucks topics, brought back some of our most popular guests from episodes past, and also paid tribute to some of the running jokes started by ourselves and those who contribute to our mailbag over the previous 99 episodes. We discussed the explosive, frenetic and draining nature of what it can mean to be a Bucks fan, including potential causes of frequent uncertainty, not knowing how to compute the ups and downs of a really exciting young team looking to be something more, and aligning in factions for one player over another. Also on the agenda, we fired up the time machine that so often features in our mailbag to run through some hypothetical Bucks debates from years past, and we caught up on some Southern tales and reactions to the Plumlee trade with NC native and friend of the podcast Andrew Snyder. To mark our centenary episode, our mailbag was jam-packed and on hand to wrap things up too, with questions on all sorts of Bucks matters. Joining me for this week’s episode, as usual, was contributor and nature enthusiast Jordan Treske, fellow site expert “Big Time” Ti Windisch, and charming Southerner and site expert at Soaring Down South, Andrew Snyder. Also, be sure to listen closely for a particular reference I make to a joke from episodes of Win In 6 past for the chance to win a Win In 6 mug as a part of our 100th episode competition. All details on the contest can be found inside the episode. If you’ve any thoughts on anything specific discussed in this podcast, let us hear them at winin6podcast@gmail.com. Make sure to follow us on SoundCloud, add us on Stitcher, and subscribe on iTunes to never miss an episode of Win In 6 in the future. If you like what you hear, rate and review us in the iTunes store. You can also find us on Facebook and Twitter. Also, if you love listening to Win In 6, you now have a chance to pick up some apparel and merchandise with our Brandon Jennings inspired logo and more! Check out the various options in our store here. As always, let us hear your more general thoughts and feedback too, and get thinking on your mailbag questions for next week’s podcast.